set up your account today. FREE SHIPPING to orders in the USA! CVM Touring Accessories' Highway Pegs were created for function and strength, keeping style a main factor in the design process. Each set of Highway Pegs are CNC machined from high grade aircraft aluminum. After they are machined, the foot rest arms are sent off to be anodized black. Once the pegs are installed, the pegs flip open-and-closed from under the black tip over cover. With this design, the pegs are hardly noticable when in the closed position. This ensures your bike maintains it's orginal style. Three different Styles: There are three different sizes to accommodate different riders. Everything depends upon a combination of height and inseam. The original design was the "J"-style peg with the straight arm. The original design was made for the "average" height of 5'9" with an inseam of 30". The second design was for the taller rider and provided an additional 6" forward position. The last design was intented to accommodate the short rider. We think these three options will provide each rider optimal leg comfort. J-Peg Style: These pegs were designed for riders with an average height of 5'9" and an approximate inseam of 30". J-"XL" Peg Style: These pegs were designed for the Longer-Leg riders with height over 5'10" and an inseam greater than 30". J-"Short" Peg Style: These pegs were designed for the Shorter-Leg riders with height under 5'8" and an inseam less than 30". Replacement J-Hardware Kit When small oops happen, you may have bent a bolt or two. 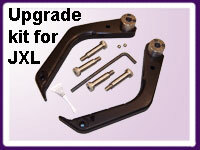 We have a hardware kit that allows you to replace the missing/damaged small parts. Replacement Black Arms and Hardware Kit: These kits provide the opportunity for the rider to replace the black arms with the same or different style. 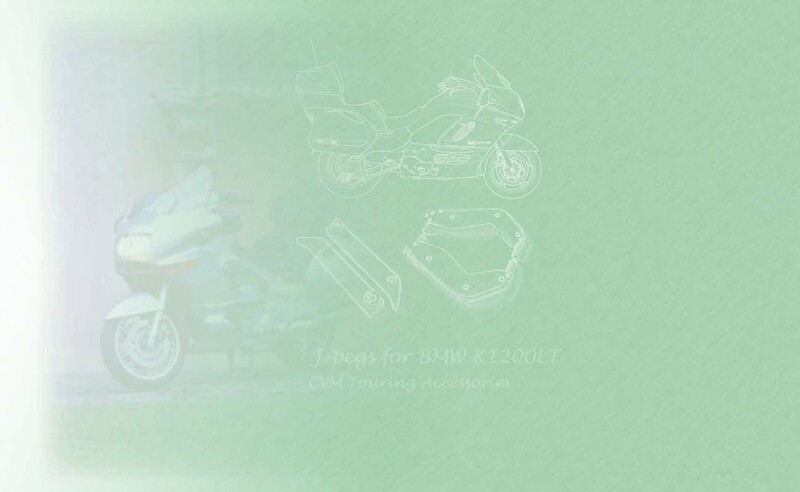 Replacement Tip-Over Bars and Hardware Kit: These kits provide the opportunity for the rider to replace the silver tip-over bars. LT Kickshift This is a great solution for riders using boots with a large toe section which may make shifting difficult or ackward. The Kickshift lever bolts directly on to the BMW's original shift lever. The purposse of adding this kickshift to your bike permits you to up-shift using your heel. The lever is CNC Machined from aircraft aluminum, is lightweight and sleek looking. PayPal maintains a secure site and your actual credit card account number will be never be transmitted to our company. For your protection, our products will be shipped ONLY to the credit card billing address. For orders from outside the continental United States or payment by Money Order or COD, contact us directly to place your order.